Jacaranda trees and substantial homes line exclusive Longman Terrace on the Chelmer peninsula. This rare elevated location provides an ideal northerly aspect to the Brisbane River and is close to schools, colleges, shopping and sporting facilities. 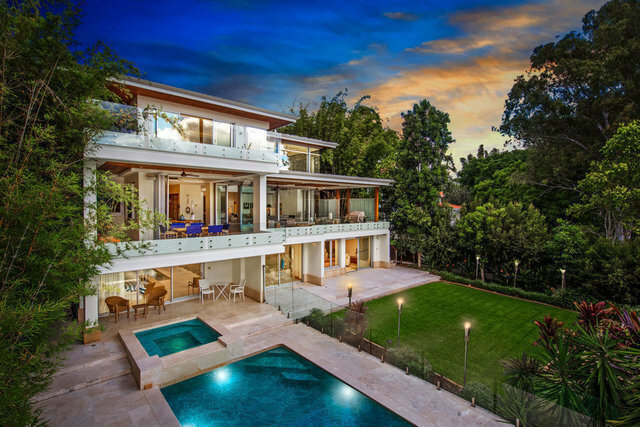 Master-built over three majestic levels, this modern mansion provides a luxurious environment in which to pursue an idyllic waterfront lifestyle. Amid the privacy of leafy gardens the home exudes a casual elegance throughout its multiple living areas, broad sunlit terraces and five luxurious bedroom suites. Every appointment for comfort and convenience is at hand, including a gymnasium with sauna that overlooks the heated pool and spa set in immaculate riverfront gardens. For entertaining or quiet family relaxation, there is a wide choice of lounge, sitting and recreation areas, plus formal dining for 12 or more served by a spectacular timber-fitted wine cellar and a Miele-equipped designer kitchen. Finishes throughout emphasise warm natural tones and include imported marble tiles with matching mosaics and custom-crafted timber cabinetry. High shadowline ceilings culminate in a two-storey atrium over the main living area and expanses of glass bring garden and river views into almost every room. Ducted and individual air conditioning plus open fireplaces ensure year-round comfort, while access to each level is via wide marble stairs rising through a spacious central lobby on all three floors. Terraced riverfront grounds feature natural rock and manicured lawns down to the water's edge where a serviced pontoon offers mooring for a large vessel. Lower level: Basement garage for up to 6 cars, 2 storerooms, massage room, gymnasium. Sauna & bathroom, large games & media lounge, wine cellar, guest suite with bathroom. Mid level: Atrium living with fireplace, timber & Miele kitchen with stone benchtops, gas & electric cooking, adjoining breakfast room. Formal dining, sitting room, office overlooking lily pond at entry. Sitting and dining rooms open via French doors to large entertaining terrace on north side. Lustrous marble floors throughout. Upper level: Master bedroom with private balcony, dressing room & marble ensuite with twin vanities, shower, spa bath, toilet & bidet. 3 family bedrooms, each with private ensuite and walk-in robe. 2 spacious lounge areas. Laundry with drying patio. Terraces and patios off almost every room for spacious al fresco living and entertaining. Practical extras include crimsafe screens, frameless glass balustrades & pool fencing, intercom to gatehouse, remote-control entry gates, electronic security, heated fully tiled pool & spa, rainwater tanks, serviced pontoon. Land area 1,518 square metres. House area 1800 square metres. For private inspections or further information, please contact Hannah Dodds on 0435 950 680.